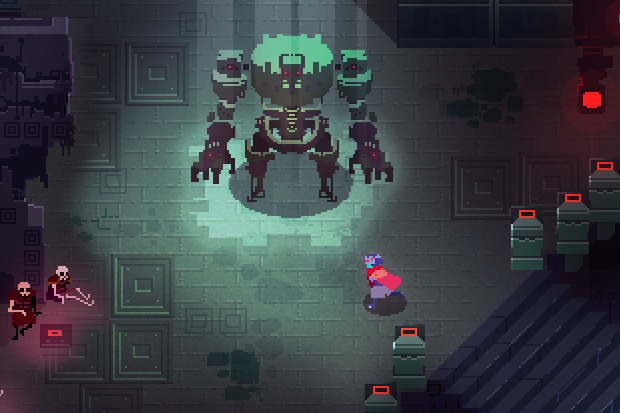 Hyper Light Drifter is a 2D Action RPG, described by developer Heart Machine as playing like the best parts of The Legend of Zelda: A Link to the Past and Diablo, but with "modernized mechanics and designs on a much grander scale". The game's Kickstarter campaign launched on September 12th and has since proven to be extremely successful; the title has reached a whopping $362,194, soaring a dozen times above its asking price of $27,000. The developer has had quite a lot of requests for Wii U support, and the latest update on the Kickstarter project reveals that if it reaches a target of $500,000, releasing the game on the platform would be possible. Gathering over $13,000 on its first day alone and over $200,000 in less than a week of launching the project, with 12 days to go it's quite possible that Hyper Light Drifter will race to the $500,000 mark. Let us know thoughts on this in the comment section below. Are these same guys who supposedly told Nintendo, "we made you a Zelda game..." but were turned down? I would never get around to play this on PC, so I'm really crossing my fingers that it makes it to Wii U. Sadly looks like my own BLOOD ALLOY won't succeed it's funding goal, but am really looking forward to this one, would love play it on 3DS and Wii U! I upped my pledge even more when they announced this. Really hope they make it. Meh I somewhat adore the art style and respect this Indie game for being different but it really doesn't seem like my cup of tea. Yet another great-looking indie game. If just some of them would actually arrive to Wii U. This looks mighty interesting! Also heavily reminds me of FEZ's visual style! @Shiryu I just watched the video. The trailer was really promising and your stretch goals were considerably low - too bad that the project is lacking its funds (especially for console versions). Why is it these Kickstarter games that are "inspired" by Nintendo games need a bigger stretch goal before making it to Nintendo consoles? @Kaze_Memaryu Thanks! We will probably keep on polishing it up and bring it back to Kickstarter sometime down the line. I really, REALLY want the team to put this on Wii U. Go grab the new exploration demo right now. @Shiryu Wow, your game looks really cool! I hope it reaches its goal/stretch goals. I think as well as some others think that once Mighty No. 9's campaign ends, people will focus on other projects more. I wish you the best of luck. 2. Clearly articulate how much you are inspired by Nintendo games and would like to see your game come to the platform. 3. Put a reasonable and attainable PC, iOS goal down. 4. Add additional features and levels goals. 5. Slap on a stretch goal a ridiculous leap from all previous stretch goals for a Wii U version. This in spite of the fact if you ported to iOS you could have ported using the Unity Engine making it readily available for Wii U as well. Damn, that does look good. I'd buy it on the U. Really looks like a classic SNES game. If I can manage the little money I have on my paypal I just might donate for once. Very pretty!! Wii U needs more of these types of games. A game doesn't magically work and get released on the Wii U just because it's made in Unity. Wii U owners will expect functionality specifically utilizing the hardware,like touch screen menus and inventories. Designing, developing, and testing these things will take time, not to mention developments kits, which you have to order from Nintendo and pay money for. @Shiryu Just curious, but what kind of advertising campaigns have you guys tried? @Pod Didn't they start distributing their development kits for free? I think I read that somewhere recently. Im gonna wait list min on this one to see if a Wii U version will come out. $500,000 to make this! seriously! I think this game looks really cool, but if there's any Kickstarter going right now that I'm worried about being crushed by feature creep, it's easily this. I won't be backing, but I'd be thrilled for them to prove me wrong. @NImH I think you're thinking of Ittle Dew. Looks pretty interesting! The artstyle reminds me of Fez and Cave story! @AltDotNerd Because porting to different consoles is far from a simple matter, and needs money and time poured into it to make it work? Often Indie developers may be using certain tools to make their game, and these tools usually require a licence to be purchased for Each platform they're porting to. Even if they're not using such tools, then it will be a lot of extra coding to get the game to work on other platforms, and may even require them to employ new programmers especially, to work on the ports. Do you think they just click their fingers and magically the game works on another platform? Think it's going to be one of those big indie hits. @Pod I may be the rare exception but often I would just be happy with an equivalent port. And Nintendo has been courting indies with free dev kits since April. It was posted on this site: http://www.nintendolife.com/news/2013/04/rumour_nintendo_handing_out_free_dev_kits_to_generate_interest_in_wii_u. If the fact that it is labelled as rumor on this site makes you leery you can do a web search to read about it on various other sites. A straight port to Wii U architecture or more still in Unity does not IMO justify the oft disparity of Wii U stretch goals to games. It appears more like fleecing hungry Wii U owners. That is why many of us wait until the goals are met AND an actual release before supporting a game with a purchase. @shuis Nintendo isn't giving free dev kits, they are giving free to try dev kits... You have 6 months to see if you like it, then you have to return it or buy it... the cheapest dev kit is $1500 and the other is $3000. @djepic209 so at its highest range the dev kit cost's 3000. Usually the Wii U ports are occurring about a month to a few months after indie titles release on other platforms depending on the developer. So why is it costing drastically much more to put the same indie title on a Wii U after the artwork, music, story, etc, and coding has already been created? All I am seeking is how game after game can be created for PC and iOS, two different architectures, and often times ported to other current-gen consoles with even different architecture than PC or iOS and then there is a huge jump in a goal just to bring the same games to Wii U. Obviously dev kits are not justifying these huge goal jumps to Wii U. In most cases, we are not hearing about all of these additional features coming to the Wii U version, so why is it so incredibly more expensive to port to Wii U for indies using Kickstarter? People have responded defensively to my question. How come more people are not legitimizing the question? It occurs time and time again that we read these stories about indie games coming out on Kickstarter that set outrageous Wii U goals by comparison to other platforms. I will not dispute that the goals for Wii U release sometimes seem a little steep. Aside from the cost of the dev kits there's an approval period, and still a fair bit of Nintendo-brand scrutinizing of the product's functionality to consider. This will all require hardware research, where time is money, quite often C++ proficiency, often times the hiring of professional (and expensive) consultants, or even more expensively: additions to the core team. Now you ask why the Wii U goals are ridiculous compared to other platforms. It really depends on what platform the team is originally aiming for, and experienced in developing for. The Hyper Light guys were aiming at PS4 and Vita as the first platforms of choice. That they can afford these at a certain point does not mean they can magically also afford Wii U development. Mighty No. 9 has smashed through it's Wii U goal but still has a long way to go to reach PS4/Xbone. Others still, like Armikrog., targeted Wii U quite early, and didn't ask for a stretch goal. Shadow of the Eternals was for Wii U from the beginning. I guess the non-defensive response to your line of questioning is that iOS and Android undeniably are cheaper to develop for, and that if you have to change your release plan based on fan-response, you're also going to have to re-budget, and taking chances with the fans' money, underbidding features and versions, is the last thing you want to do. Look at Double Fine. Even if they're delivering a much bigger game and a much longer documentary than anyone had anticipated, at the same price to backers, people are STILL railing on them for not staying on budget. People with less experience, less confidence (and let's face it, less ham,) would not be able to take that kind of abuse from the gaming public. Phil Fish being a great example, even if he fought bravely. Heart Machine just announced today that they will release Hyper Light Drifter on the Wii U if it meets the stretch goal of $550,000. 7 days left. I hope it'll make it! @Pod Thank you for your patience and well thought answers. Thanks for bringing up a topic I think many have been pondering.